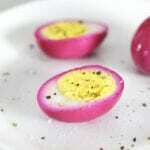 Have you ever had the opportunity to try a Pickled Beet Egg? I’m someone that loves pickled eggs and have since I was a kid! Growing up, we would typically only have them during the holidays — usually for Easter or Christmas. Since I started Keto, they’ve been making a regular appearance in my meal plan. In addition to the holidays, they’re an awesome ready-to-eat snack option and the perfect side dish for picnics, too! Preparation is so simple and they’re absolutely loved by every member of my family. Why beets and which type? Beets aren’t especially low in carbohydrates, but they can be enjoyed in limited amounts. In this recipe, we’re using them for that signature purple color — along with a slight beet flavor. Do note that this information is strictly for the beets themselves. We’re going to be using the water and red beet juice mainly, which adds very little carbohydrates in the end. For this recipe, I like to use canned beets. They’re inexpensive, already prepared and make very little mess in the kitchen. I’ve used fresh beets in the past and they work well, too. I just don’t care for the preparation that typically results in a huge kitchen mess! When choosing beets, make sure to select a brand that lists the ingredients as just beets, water and salt. Be sure to avoid the jars of pickled beets — they’re usually loaded with sugar. If you’re tired of hard-boiled eggs, pickling them is an easy way to change it up. There’s something magical about them! When I have just regular hard-boiled eggs, I typically only consume one or two at a time. They lose their appeal quickly. With pickled eggs, I can easily eat double the amount. Be careful, these things are addictive! My absolutely favorite way to eat these is thanks to teachings of my sister, Shannon! Just a sprinkle of salt, ground black pepper and a generous dash of hot sauce. I also like slicing them up and adding them to a salad. The kick from the vinegar does wonders for an otherwise boring lunch! 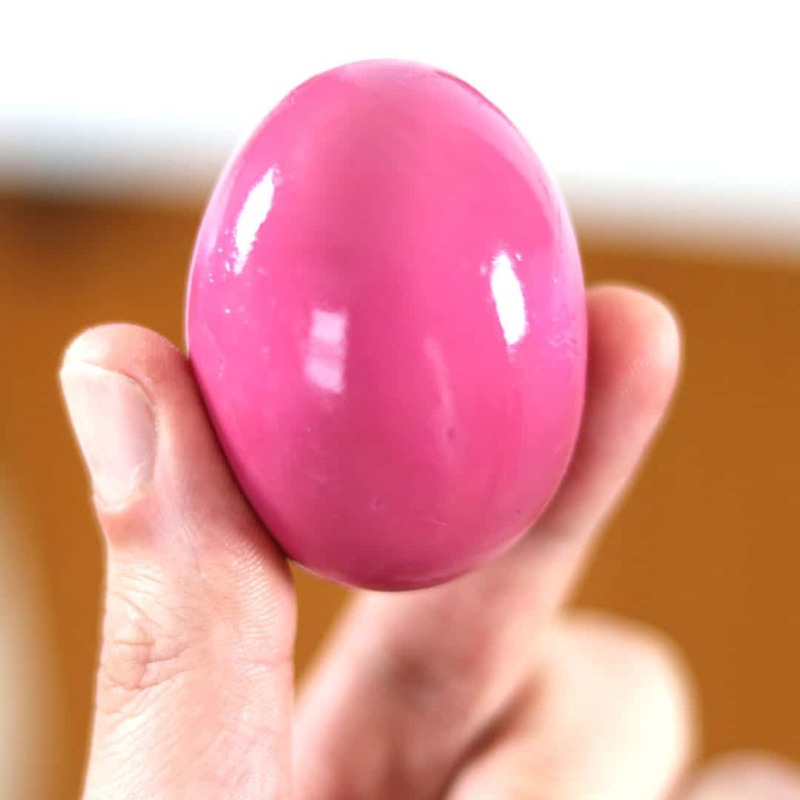 They even work well in egg salad, too (yes, it will be purple). 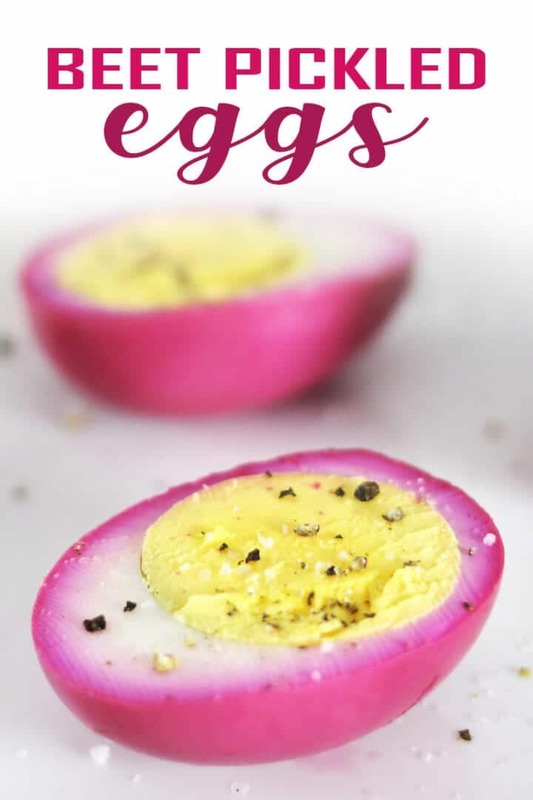 My Pickled Beet Egg Recipe is a great holiday side dish or protein-packed addition to any salad. Prepare hard boiled eggs and remove the shells. Rinse. Add eggs to a large glass jar (with a lid). Open can of beets and pour all contents over the eggs. Add filtered water to the jar -- just enough for covering the eggs and beets. Stir to mix. Place a layer of plastic wrap on top of the jar before screwing on the lid. Refrigerate for at least 24 hours. Best results after 48. If you decide to eat the beets (I do! ), just count the nutrition information from the can you used. Vinegar and water add minimal nutrition to the final product. Do you have a favorite pickled egg recipe? Let me know in the comments! Can you list what can size you use for the beets? I’m assuming they come in multiple sizes at the grocery store. OMGosh, these are cute! I will definitely be serving these with Easter brunch. Sometimes the best recipes are the simplest, and this is a perfect example. Thank you!